A common occurrence in video gaming is the “deconstruction” of a game, an attempt to describe how the design works, perhaps what it derives from. While I spent several hours watching five people play this game it proved to be pretty easy to deconstruct. This game of Japanese warlords was originally published by Milton Bradley and now Hasbro and dates back to about 1987. If designed today it would definitely be much smaller, perhaps accommodating not more than four players, to reduce the length from its current 4 to 6 hours for five players. One reason why it’s so long is that it derives from Axis & Allies and Risk, both often quite long games. The Risk influence is clear in the board of many territories (a lot more than Risk’s 42) with lines connecting some territories to enable movement across the seas. There are some really long connecting lines “above” and “below” the three main Japanese islands to provide some circularity and width, because even with many territories the main routes through the islands are quite narrow, only a few territories wide. The game includes a card for each territory as in Risk, and starts with a random distribution of cards so that each player’s holdings are randomly distributed throughout the three major islands (Hokkaido is not included, at the time of the samurai it was occupied by the white-skinned Ainu people). This is identical to the original French way of starting Risk, rather than players choosing their territories. There is no turn-in of cards as we see in Risk. The card turn-in is a kludge designed to bring Risk to a finish, whereas Shogun has a different method. Allocation of new armies follows the Risk method of one per three territories. In Shogun the result is money rather than armies, which can be spent for a variety of activities (mostly new troops), and can buy as many as three of the weakest troops for one unit of money. The Army organization of the game is the part that comes from neither Risk nor A&A. Each player has a large cardboard layout allowing for the placement of many units in each of three armies, along with three flag markers (generals) each on a track that can increase their experience. The corresponding flags are placed on the board to show the location of the armies. In addition there is a ninja which can be hired to try to assassinate a general (67 % chance); if the ninja fails the intended victim can hire it to try to kill one of the attacker’s generals! Here’s the mechanism that enables the game to end sooner than otherwise. If you kill a player’s last general by defeating his army, you get all his remaining pieces and territories. Winning the game depends on controlling a certain number of territories, for example 30 in the five player game, more in games with fewer players. It’s a more elegant solution to ending the game than the turn-in cards in Risk. There is even less history built into this game than into Axis & Allies itself. It’s a long game with a lot of miniature figures and a lot of dice rolling. People involved in creation of something out of nothing really do get their ideas in odd places, sometimes. I get a significant “input” to my game design when I’m in the shower and while I’m lying awake in bed. This idea popped into my head at “Oh Dark Hundred” recently. A little introduction might help. My most well-known game is Britannia (1986 and later), and there’s going to be a reprint with plastic figures in the next year or so. To go along with that, the publishers wanted me to make a two player version of the game that lasted 60 to 90 minutes (Britannia itself is 4 to 5 hours.) I’m surprised and pleased at how well it has come out. It uses a new board, lasts 65 to 75 minutes, and is recognizably Britannia-like. 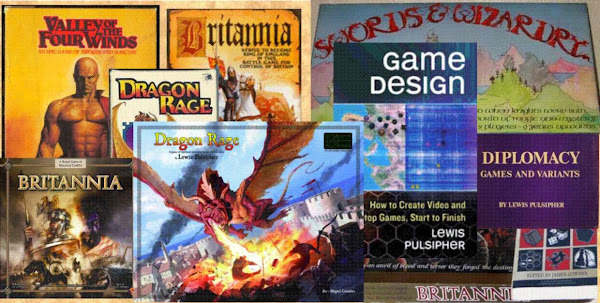 So it’s not surprising that now my thoughts occasionally turn to creating two player versions of games for more than two (Britannia has four players). Usually this is my own games, but this morning it was Diplomacy. Insofar as the essence of Diplomacy is playing against the other players, a two player game cannot be Diplomacy. In other words, Diplomacy is about the psychological part of the game and much less about the game system. Yet the “Gunboat Diplomacy” variant has been popular, and that’s a game where any negotiation is prohibited. With two players, much of the psychology is gone. So, I said to myself, if we’re going to abandon the essence of the game anyway, what can we do to change the game to make it more interesting for two players? Because with two players it would be a sort of a chess match that depended on who guessed best in the strategic/tactical part of the game, and would be devilishly difficult to balance fairly. By removing the multiplayer aspect we remove much of the uncertainty of the game: with two players you can minimax it, you can assume the other player is perfect and play accordingly to maximize your minimum gain as in the premise behind the mathematical theory of games. Chess, Go, Checkers survive the situation because they are too complex to be solved by humans, though all three are played better by computers now than by the best humans. That’s not desirable, so I would replace the uncertainty of more than two players with two things: dice in combat and event cards. Now I can hear many Diplomacy people sucking in a deep (dismayed?) breath at the idea of overt chance elements in the game, but I’ve explained why I think it’s necessary, and I have a dice combat system that would only mildly affect things but would provide an element of unpredictability. That method is that you roll one die per Army or fleet in the combat, including supports. The side with a higher sum wins the combat, with ties going to the defender most likely (or rerolled if both sides are attacking), but that’s something that would be determined in testing. For example, a supported army (two) attacks an unsupported army (one). Rolls are 4,5 for the attackers, so the defender cannot win (can’t get more than a 6). I use this method in Eurasia (name likely to change to something like Surge of Empires), which is scheduled to be published sometime. Another way to provide variance in combat would be to use combat cards rather than dice. Each player would have the same set of cards, but different ones in hand at different times, and it would be a guessing element involved in whether you play a strong card or weak card to add to the combat (there are also some special cards). I use such a method in several games but I’m not going to go into it here. I don’t know if event cards would be necessary, and I haven’t tried to come up with any kind of scheme. But event cards are a way to add interest and variation to a game that the players can control in a way that they cannot control the dice, though with dice they can play to take account of probability. The other point of uncertainty/variance would be in selection of the sides. While lying in bed I tried to think of an entirely fair three versus three and didn’t get very far. I’d probably use a combination of selection and chance to assign countries. The first player would choose a country, the second player would choose two countries, the third player would choose a second country. The third country that each received would be determined randomly from the three remaining. And for the one that was not controlled by either player, we could use a method known in some Diplomacy variants, where the players write orders (say, five of them?) for the units of the uncontrolled country. They can allocate all five (identical) orders to one unit or spread them amongst the units. If a unit received a majority of the same order then it would execute that order. Of course, you could go further and do that for all three countries that the players had not themselves selected. How long would this game take the play? I should think it would hit that magic 60 to 90 minute length that is commonly desired nowadays in wargames, if not to the victory criterion then certainly to a point where one player resigns. It would be quicker, of course, if you had some electronic method of giving orders/moving the pieces. Handwriting orders for two or three countries takes a while. Abstract games are by definition not models of any particular reality. Which mechanics are used is only a matter of arbitrary choice for the designer. Classic abstract games like Chess and Go are also simple games, games that reflect my motto: "A designer knows he has achieved perfection not when there is nothing left to add, but when there is nothing left to take away." -Antoine de Saint-Exupery. Another form, about Japanese art-gardening, is "Your garden is not complete until there is nothing else that you can remove." In other words, simplicity is a virtue in itself, because it enables the player to easily understand the mechanics and be able to focus on the tactics and strategies of the game. You could say that abstract games are naturally minimalist. Point Salad games are almost always abstract. But there's a category of games that may not be Point Salad, but still seems quite arbitrary: "Mechanics Salad". A completley abstract game is a small collection of mechanics, but in Mechanics Salad there are lots of mechanics. Sometimes it seems as though it's a game made up entirely of exceptions to the rules, except there don't seem to be any basic rules, just lots of individual cases. I don't care for Mechanics Salad because they are abstract games without the main benefits of abstraction (from a gameplay standpoint), and all the disadvantages of puzzles (I dislike puzzles). This makes the game hard to learn: we don't have the context provided by a model to help us understand how the game works, but we don't have the fundamental simplicity of the classic abstract game. The other problem with Mechanics Salad is that it's hard to bring harmony to the game. (Read www.gamasutra.com/blogs/LewisPulsipher/20170424/296624/Harmony_and_the_Kludge_in_Game_Design.php for my extended discussion of harmony; briefly, everything in the game seems to fit with everything else, nothing in the game sticks out as not fitting or not belonging.) It's much easier to bring harmony to simple abstract games. Okay, then why would you make a Mechanics Salad game? Because you want to make a parallel competition puzzle, not an opposed game. In a parallel competition the players can do little or nothing to affect the other players deliberately, and perhaps not at all. Puzzles that are more complicated are often harder to solve. In practice, it's difficult to make a really simple game that actually has much depth to it. (And I mean depth, not variety.) It's much easier to make a more complicated game, though it's much harder to make a more complicated game that's really good. Yet Mechanics Salad is a popular kind of game. More people like puzzles than like games, I think. As I have retired and gotten older, and now moved to Florida which is farther from the major game conventions than my old home, I’ve had to pick and choose which conventions I go to. I stopped going to Origins quite a few years ago because it had diminished, and I’m not convinced yet that it has recovered sufficiently to be worth my time and money. It appears I will not be going to the UK Game Expo again (it is more than 4,200 miles). (Keep in mind, being retired means you have more time than money.) Last year I didn’t go to GenCon because I wanted to avoid the 50th anniversary insanity but mainly because the schedule just didn’t work out. I try to attend WBC in Pennsylvania (880 miles from here) and then go to GenCon, possibly with a few days with my brother and sister-in-law in DC in between. In 2018 I should be able to do that. I also like to go to Prezcon in Charlottesville Virginia at the end of February. I know a fair number of people at both Prezcon and WBC, whereas at GenCon I might see a few people I know but everyone is so busy there’s rarely time to talk. I attend small conventions here in north Florida – there aren’t any big game-only conventions nearby. Dice Tower con is the big convention in Florida, but Miami is 368 miles from here, and the Dice Tower caters to the “oh shiny” generation and games that are often puzzles disguised his games - not my interest. There’s a prototype con 2+ hours away, but I can’t go to both it and Prezcon because of scheduling. I went to the first one and it was, once again, just about all about parallel competition puzzles disguised as games. In a few years GenCon and WBC will be at the same time, and I’ll surely prefer WBC.